Smartwatches are often pigeonholed as consumer gadgets for tracking fitness goals or streaming music, but innovative businesses are starting to discover some unique use cases for these wrist-worn devices. Whether it’s to streamline bank branch operations, improve customer service or keep police officers safe, smartwatches deliver instantly accessible, hands-free alerts and notifications that help keep teams nimble and up to speed. For organizations concerned about health and safety, their built-in sensors — GPS, motion and heart-rate — also offer a way to track the location and condition of team members. 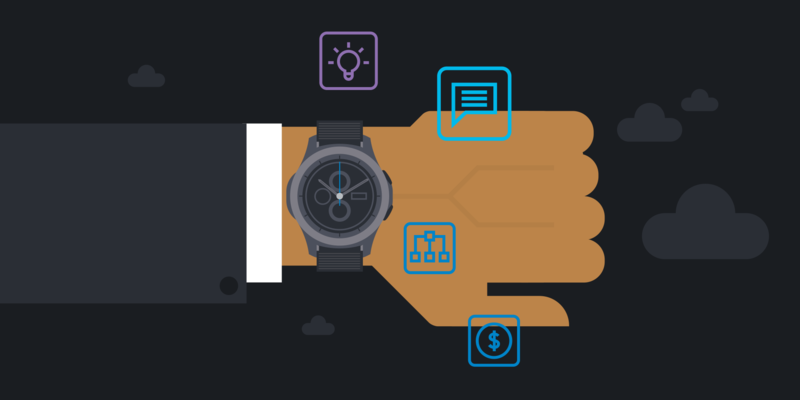 At the core of every successful enterprise wearables initiative is a well-designed application. Developing applications for wearables is a new paradigm, even for highly experienced mobile developers. Successful user interactions with watch faces and widgets require a streamlined UX defined by ease-of-use. In my role on the Samsung Business Services team, we work with enterprise customers to design and develop wearable applications for Samsung’s Tizen-based smartwatches. We also offer a jumpstart seminar for enterprise dev teams looking to create Tizen smartwatch apps internally. In this post, I’ll share some of the key resources and frameworks available for those exploring app development on Tizen. Everything you need to get started creating powerful applications for Tizen smartwatches is offered online by the Tizen and Samsung developer communities. Resources available in these online communities include extensive documentation of best practices, code sharing and active user forums. Tizen’s Studio offers a complete launchpad to build apps for mobile, wearable, displays and appliances. The development environment is built on the Eclipse Integrated Development Environment (IDE), the most common Java IDE. Experienced Android developers generally find the studio environment, menus and user flow intuitive, or even familiar, based on previous exposure to Eclipse IDEs. Within the studio, developers are given the choice of using Native or Web tools to create applications. Each of these options has distinct use cases. Native: Native development of wearable native watch and widget applications can be written using the C programming language. This is the best approach to developing applications which require access to low-level components, such as wearable sensors or hardware buttons. Developing applications for wearables requires developers to think differently about the user interface and device components; you can’t simply transpose a smartphone UX to wearables. Great experiences for a smartwatch are designed specifically for the screen size and format; in the case of the Galaxy Watch, it’s a circular 42mm or 46mm display. Users of wearable devices typically interact with a single quick touch, a gesture or a turn of the bezel. Successful smartwatch experiences are intuitive and simple. In addition to recasting how you think about design flow, developers need to think about the new possibilities and limitations of the hardware components when creating Galaxy Watch applications. Smartwatches are inherently small devices, which means they have a small central processing unit and a limited battery size. Consider these factors when designing apps which pair to a smartphone or interact with a remote back end database. Application processes that require constant communication over a network could sacrifice battery life or performance. Success criteria for wearable design include a simple UI which is optimized for easy user interactions and analytics for continual improvement. Efficient UI: A great user interface for a wearable widget or watch face is much simpler than an optimized UX for smartphone apps. Information and notifications will be read by users with a quick glance, which means scannability is paramount. Optimize readability through consistent, intentional design and careful testing. Wearable design best practices include using no more than one button per page or creating clear visual cues for users to access a menu of more options. Intuitive Flow: Users need the ability to quickly control widgets or watch face applications by interacting with the device bezel. User frustration can easily arise when tasks require complicated interactions with the bezel. Intuitive flow requires responsive design and easy-to-use app components, including clear connectivity between the bezel component and on-screen application options. In some cases where users need to complete a complex task or navigate through multiple options, creating menus or headers on-screen can simplify flow. Analytics: To ensure future success of enterprise wearable applications, developers should create and monitor analytics to measure the quality of UX and continually improve the product post-deployment. Analytics can reveal opportunities to simplify the flow of user interactions and response to notifications or events. Business adoption of wearables and other smart mobile devices continues to accelerate. There’s never been a better time to get started developing mobile applications for a rich ecosystem of connected devices, and the Tizen and Samsung developer communities offer rich resources and accessible options for developers to expand their portfolio to wearables. The latest iteration of Galaxy smartwatches offers an unprecedented number of use cases and opportunities for businesses in many verticals, including public safety and finance. With improved sensors and accuracy to track movement, heart rate and user location, the next generation of smartwatch apps can empower businesses to drive better employee and customer experiences. From healthcare to hospitality, see how wearables are transforming the workplace.